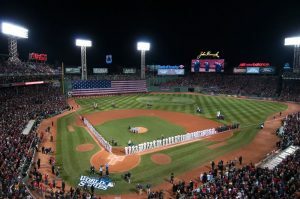 Baseball is heating up, with roughly two months left in the regular MLB season, any team that still has a chance to make it to the post season is set to exhibit their best game yet, which makes these next couple of months the most exciting for baseball gamblers. Soon we will be able to see the World Series Odds posted by sportsbooks around the world. Although nobody knows who will win it, there are some clear favorites, however, we have all been disappointed in the past when our favorite team or the one with the best regular season record folds under pressure in the post season. So it is too early to call a winner yet, but one thing we do know; since the American League beat the National League in this year’s All Star Game 4-2 they will have the home field advantage in the first World Series game this year. That’s right folks, the purpose of the All the Star Game, aside from the obvious publicity is to determine which league will have the home field advantage when the Championship Series starts. Even though we are still a long way from the Championship Series, sportsbooks are already doing their due diligence and are coming up with possible scenarios and preliminary World Series Odds to be able to post them as quick as possible. How do I know this you may ask? Well I was lucky enough to be able to sit down with some of the best line makers, these guys work at AceSportsbook.com but have asked me not to release their names for obvious reasons. In an interview I had with them this past week, I asked what goes into setting what many consider to be the best World Series Odds of any sportsbook. Their response was not what you might expect, I was imagining them telling me how exciting it is to come up with these lines, and as it turns out it is quite tedious work, a lot of analysis of stats and weather forecasts, location and time of day come into play, but there is also a hefty amount of experience and gut feeling. According to them, the idea is to make the line as fair as possible; on the one hand you want the line to be sharp enough so the more experienced players find value in it, but you also want to give the square guy a fair line, balancing these two premises is often easier said than done, but over the years they have come up with the perfect formula to create lines that appeal to every baseball bettor across the board. Unfortunately, I was unable to crack them and obtain this formula. When this next Championship Series begins in late October, you will have a deeper understanding and appreciation for the work that goes into making the best World Series line.